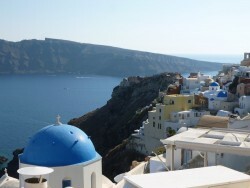 The white-washed stone houses and blue domes of the churches of the cliffside village of Oia, Santorini. We were finally there, to experience the sight I had always stared at in the picturesque photograph above my desk. I had dreamt of seeing the sunset over the crystal clear blue water of the Aegean Sea, bouncing off the white cliffside houses and the blue domes of the churches of Santorini. My grandparents had told me about that same exact scene when they had seen it many years ago, as had my parents when they had visited decades after. Now, my opportunity had finally arrived to take in that timeless experience, to turn that dream into reality. Sitting there at a small café overlooking apartments, other shops, and alley ways that zig-zagged their way to the water, time did not even seem to exist. Gradually, shadows began to appear on the glistening white buildings as the sun made its way down to the edge of the water. The sky changed from a cloudless blue to an incredible orange before a red sphere finally descended below the horizon, leaving all of us amazed by the beautiful and timeless sunset we had just seen. When we reluctantly stood up and retraced our tracks into the heart of the village, we realized more than four hours had passed. 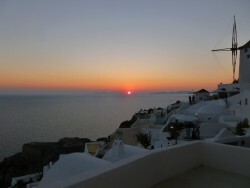 While taking in the sunset off of Santorini, time stopped: the moment itself seemingly transcending the element of time. It is an experience for which words cannot due justice and whose beauty cannot sufficiently be captured in pictures. However, this idea of time passing as we embraced the moment was nothing new to me. When I was a kid, a second generation Greek-American who was fully immersed in American culture, family get-togethers were all day affairs. It didn’t matter what event it was – a birthday, Easter, Christmas, Thanksgiving, or just a regular dinner – we would all be together, eating endless amounts of food, sharing stories, watching TV, eating dessert, laughing, going for seconds and thirds, and continuing to talk. Just like the sun setting on Santorini, eventually it would get dark and then hours later, relatives began to fall asleep, one by one on the couch. We were all tired but nobody realized what time it was nor wanted to leave. By the early hours of the morning, wives had to wake up husbands so fathers could drive their exhausted children home for the night, and we all slept extremely well, on stomachs full of delicious food and hearts full of family love. I have always cherished this aspect of my family: the closeness, the warmth, the hospitality, the experiences that caused us to lose track of time. I am not sure if this is a characteristic of our family alone or Greeks as a whole (or for that matter, that of many other heritages). However, after recently making my first visit to my ancestral homeland, I noticed many similar characteristics and a lifestyle that embraced the moment and allowed time to adapt to it, instead of the other way around. I felt right at home, to the say the very least. Timeless pergola in Kifisia built by our great-grandfather. 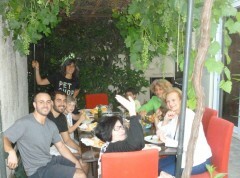 While we stayed at our aunts’ house in Kifisia (a suburb of Athens), we enjoyed long dinners outside on the terrace beneath a pergola, the same pergola that was built by my great-grandfather nearly a century ago. Like that timeless pergola, we discussed aged-old topics of politics, economics, ethics, family, etc. at the table as that same sun began to set over Athens. Just like at home when my mom used to cook for us, dinner was not just a meal – a mere ingestion of food and energy – it was a part of the day, an event to come together and share our experiences and thoughts, while eating delicious home-cooked food, of course. Every night we were there in Kifisia, we sat out there beneath the pergola until late at night, and then took the conversation inside until the early hours of the morning. My aunts and uncles would be up at the crack of dawn with their small children, yet this was customary for them, to eat late, to talk, to enjoy the moment, to embrace life. It was not long into my visit to Greece when I realized that although I had a schedule of things I would like to do, I had to be ready to adapt that schedule, as was the case when a salesman, completely unprompted, shared his life story with us, showed us clips of Captain Corelli’s Mandolin on YouTube from his computer on his desk while narrating them himself in his Bulgarian accent (as an introduction to the Greek island of Kefalonia where the movie was filmed), served us a Greek coffee and then analyzed our fate based on the grounds at the bottom (a Greek tradition). Finally, we received our tickets for the tour we wanted to go on the next day. He discounted the price for us on the fly, maybe because we were Greek or maybe because we had been good listeners, that is still a mystery. We left the travel agency slightly perplexed and shaking our heads wondering what exactly just happened, and of course, we were late for dinner at our aunts’ house. This instance reminded us of the times we had just stopped by our Yiayia’s house to drop something off for our dad when she told us to sit down and that she would make us something to eat. Even if we had just eaten prior to arriving, there was no stopping her, as she insisted that we were hungry. Before we knew it, we were there for hours, hearing old and new stories about the family, ones we now know by heart and that we will be able to pass down one day to our kids. Whether it is a 5-minute transaction at the travel agency or a 5-minute stop at Yiayia’s house, we lost track of time as we became absorbed in the moment and enjoyed every unexpected minute of it. Perhaps my favorite example of this Greek phenomenon of timelessness was our Santorini beach adventure. My brother and I woke up early and went to one of the many beautiful beaches on the island. By a little after midday, we were ready to return to our hotel and eat lunch, which was a 20-minute bus ride from the beach. We walked from the beach to the bus stop at the corner and sat down as we waited for our bus. One bus after another came, and each turned right at the intersection before our stop. A half an hour passed, then an hour, and still no bus continued straight down the road to our destination. In the meantime, people began to gather with us at this stop and we all waited in unison under the clear blue sky and afternoon sun. Finally, after about an hour and a half, the bus, which is supposed to run every 30 minutes, did not turn right and came to our stop. Two loud, hairy Greek men stepped out and started yelling a mixture of Greek and English phrases and ushered people with incredible made-for-Broadway hand gestures onto an absolutely packed bus. We stood in the aisle as the bus driver cruised down the windy road, occasionally interrupting his conversation on his cell phone with the restaurant owner who was preparing his meal to announce the next stop. We were one stop away from our road to the hotel when the bus stopped and remained motionless for several minutes. We thought maybe there was an issue with the bus. Nope, that would have actually made sense! Instead, we looked out the window to see the bus driver’s assistant walking from the restaurant across the street carrying several coffees for himself and his colleagues. With coffee in hand, the bus driver was ready to continue the journey home. When he dropped us off at the last stop, we noticed him get out as well and enter that restaurant he had been on the phone with, sit down, relax, and enjoy the meal he had ordered earlier with several other people. I nodded my head feeling good on the inside. Greeks, from my experience, have a certain unique relationship with time, and that relationship makes their personal interactions that much more genuine and warm. No matter what, they take the time to introduce themselves, learn about you, discuss anything and everything. In Greece, you may wait a while for your bus, but the memories you will have from sharing your experiences with people who truly live to enjoy life, regardless of the time it takes to do so, will last forever. For Greeks, at least as far as I have found to be true, time does not control their lives; it merely elapses whilst they live it.